Visit www.here.org or call 212.352.3101. (Left to Right): Vera Beren, Michael Tomlinson, and Catherine Porter. Photo by Stefan Hagen. BOTTOM LINE: A detailed foray into the darkness alone - too alone. 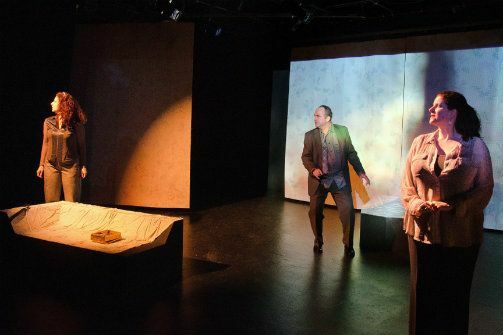 Renee Philippi’s new play Alone in Triptych, now playing at HERE Arts Center and directed by Philippi and Eric Nightengale, must be a lonely play to perform and to have written. This is partly intentional. It’s also rather lonely to watch because the characters’ behaviors are recognizable yet beyond help. Philippi desires to delve into three dark corners of the world where three individuals must struggle with their arrival at isolated dead ends. Unfortunately the play begins at those dead endings and leaves little opportunity for the characters to make any credible journey. The idea behind a “triptych” is to display three seemingly separate variations on a shared theme. Philippi does draw up a world in which this structure could thrive. Her three characters have arrived at the brink of loneliness through self-destruction and some bad luck. Leeann (Vera Beren) is an overly dedicated girlfriend to a man who is discovered to have raped a teenage girl. The next lost soul is Lori (Catherine Porter) who lives in Bavaria—although location is rather random in this play and serves mostly to drive home the point that these characters are not intertwined geographically. Lori is abused by her husband and sits at home all day crafting female-depreciative jokes to titillate her “master” into not hitting her. When these jokes fail, she offers up degrading sexual gifts. Since her husband is a cop, she also uses that connection to keep the authorities at bay when things get out of hand at home and the neighbors call. Lastly, we visit the UK and meet Remi (Michael Tomlinson) who has just kidnapped the daughter of an acquaintance of his whom he deems is in danger because society will take advantage of her purity—as we learn happened to him at an early age. His storyline holds the most mystery in the play. These scenarios sound difficult enough to watch, however it’s made more palatable by the fact the characters are sharing the stage with their invisible opposites. This factor however makes the job of the actor far more difficult—if not impossible. It’s a device Philippi employs to enhance the fact that her characters are truly alone despite the relationships they’re in. What results though is essentially a 70 minute long one-sided phone conversation on stage. This is the kind of dramatic writing where the offstage character’s dialogue must be relayed by the onstage character. This ultimately undercuts the ability for the character to stay active. Beren manages to bring her dialogue outward more so designating the audience as the stand-in for her boyfriend. This soliloquy style is more engaging from an audience standpoint. The rest of the cast struggles with living the entire play within their own heads due to the lack of a target for their actions. Nightengale and Philippi weave the play in a layered, if sometimes legato, manner. Haunting music designed by Beren and shifting canvases designed by Carlo Adinolfi bring the production to the metaphorical island where these three people can inhabit without ever connecting. Some of the technology and transitions are a bit clunky, hampered by some technological mishaps on the night I attended like a rogue fluttering mouse cursor on the projections. The overarching symbol in Stefan Hagen’s projections is none other than the Chekhovian seagull soaring freely. Philippi has set up a structure where her characters could maneuver in any way feasibly. Currently they are thrown into a very immediate present tense in horrific situations with no partner on stage. The gravitas of some unbelievable occurrences in the play sets the bar extraordinarily high for these actors to reach within that immediacy all alone. There is opportunity for the script to play with time and space still, opening up the characters to attack their trapped world from a heightened state. As of now they are stranded onstage throwing passes to themselves leaving us focused on the loneliness of the actor rather than the character. A triptych works best when you can pull back and see the totality and interplay of all three canvases. Philippi’s play has fascinating people in incredibly dramatic situations that just can’t live up to those realities in this structure. Perhaps a little blurring on the canvas will reveal more underneath.